I suppose by calling it a camp, it kind of brought expectations of the types of summer camps you get in the U.S, however having been to Barcelona and reading about others experiences of the Girlie Snow Camps I knew this was going to be hell of a trip! On arrival day, I was skating the city a bit but managed to be around the hotel and meet some of the girls and the Girlie crew. I was immediately impressed and excited by the idea of skating and spending time with all these people. I'm usually quite a shy person but I found it easy to talk and share experiences with everybody on this camp! There was just such good craic, if you know what I mean! 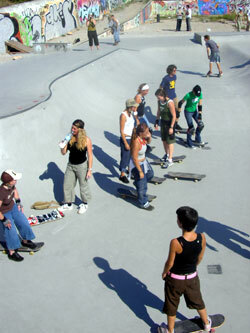 The first full day on the camp, we traveled to Sitges Skatepark. This park was good, well designed but slippery as hell! The girls were fully up for it though; everybody got in there for what was sort of a bowl carving session. Nobody was left sitting by the side, everyone was giving it there all, whether it be learning axle stalls or just learning the basic stance. I enjoyed this morning so much because it was really inspiring seeing so many girls that were totally up for skateboarding! It was amazing to see the Americans skate, Lauren Perkins was cruising the bowl doing frontside 180's and shredding the grind box with 5050's and 5.0's. Steamer was steaming it in the bowl carving lines and she hit up a crook on the ledge! I had fun doing some fly outs and then got a backside 5.0 on the box! After Sitges we all hung out at the beach and it was cool to talk more with some of the girls, the atmosphere was chilled and it seemed that everyone was feeling stoked on skating! After more skating that afternoon we met back up at the hotel and went fora night skate at MACBA. There was a great vibe and even though I think most were tired, you have to skate at MACBA if your in Barcelona! I have to admit; I didn't think that skating at MACBA would be all that because when I've visited barcelona before, I got quite intimidated by the skate history surrounding the spot and there are usually many locals and pros ripping it up. Turns out that I was completely wrong and being there with a crew of like 20 girls made it an awesome skate! Lauren Perkins loved it and got a photo of backside 5050 the ledge to drop and she made it like 4th try! Some girls practiced ollieing or what they had been taught earlier on and some just took it all in watching others. Sonia Kenfech ripped on a ledge doing all sorts off it, even a smooth nollie heelflip! Great end to the first day! Each day kicked off in such a good way, seeing loads of girl skaters at breakfast and listening to all the skate conversation going on! It was so weird but in the best way! Schedules had changed but for the better as we went to an absolutely epic spot called Fondo. The session was probably one of the best in my life for sure. As a girl skating with guys all the time its quite easy write things off by thinking 'oh well he can do it because he's better than me' and although I do feel pushed, this was a completely different experience. I felt so amped by seeing girls skate well and thought if they can do it, so can I, confidence and self belief! There was so much good feeling that day, so many tricks went down and everyone had a rad skate. frontside flips on bank and Switch heel on bank. Afternoon, we went to Canyelles park. The vert skaters on the trip were excited to be going to ride some transition but I think everyone was a little nervous when we got there! The park was tight and for most even unskateable, but I think some girls were glad just sit and watch after the session at Fondo! Mimi Knoop, Julia Bauer and Tina Neff ripped this place! Knoop carving smooth lines with nice Frontside smiths and Jewels and Tina both getting rock fakies on the vert extension! Rolling around the park and chilling finished off a well good days skating and there were nothing but smiles on everyone's faces! Day of the Jam: The jam was kicking off at 2 so for most, a lay in was in order! Not the British contingent! We got up early after 4 hours sleep and hooked up with Julie Bevis to do some filming for UK video Viewfinder! Hit up a spot called Besos where Julie nearly got a long manual kickflip out but couldn't quite ride away. After about 15 calls of 'last try, c'mon' we had to get out of there or we were going to miss the jam! Turns out that we met up with everyone at Sants Station and that was one of my best moments of the camp! Being almost lost in Barcelona and then suddenly seeing 20 girls with skateboards come round the corner, it was spot on! 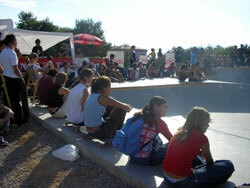 As we arrived at Sitges park, it was crazy, there was a big crowd which I didn't really expect and loads of skaters. Everyone was up for it straight away, so much so that most pros were exhausted by the time of the demo! I loved it and gave 100%, I felt so pushed again and was stoked to be riding with all these great people that I'd met on this trip! Thank you Girlie Camps! This was the best time of my life and I'm looking forward to doing it again, roll on next summer! Real Skate Copyright © 1999-2005 by Clarkie, Santa Cruz, CA. All rights reserved. No part of this publication may be reproduced by any means; electronic, mechanical, photocopy, or otherwise without the prior written permission of the copyright owner, photographers, writers, or artists named herein. Trademarks mentioned herein are the property of their respective owners. (What this means is, Please Don't Steal! ).